I’ve been GF for over three years. I gave up on manufactured, GF bread and pasta, years ago. When baking, I tend to gravitate towards the simplest recipes. Let’s face it, it’s very difficult to master GF baking without the addition of weird, binders and flours. So, I’ve gone without sandwiches, flour tortillas and pizza this whole time! Pizza has been the most difficult sacrifice! 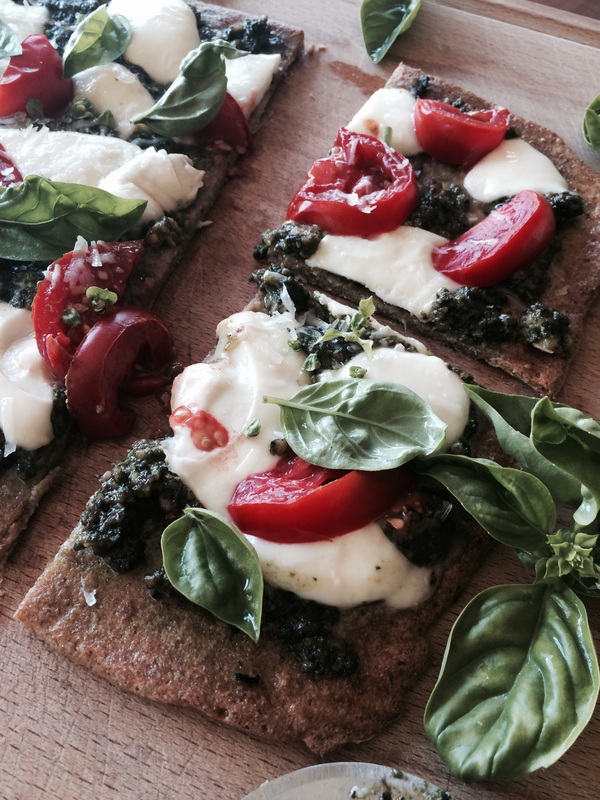 One of my favorite meals, is a rustic style, thin crusted pizza loaded with fresh veggies, gobs of mozzarella and pesto. Well the wait is over! I’ve discovered the most incredible, easy to make, GF pizza dough EVER! All you need are 4 ingredients! 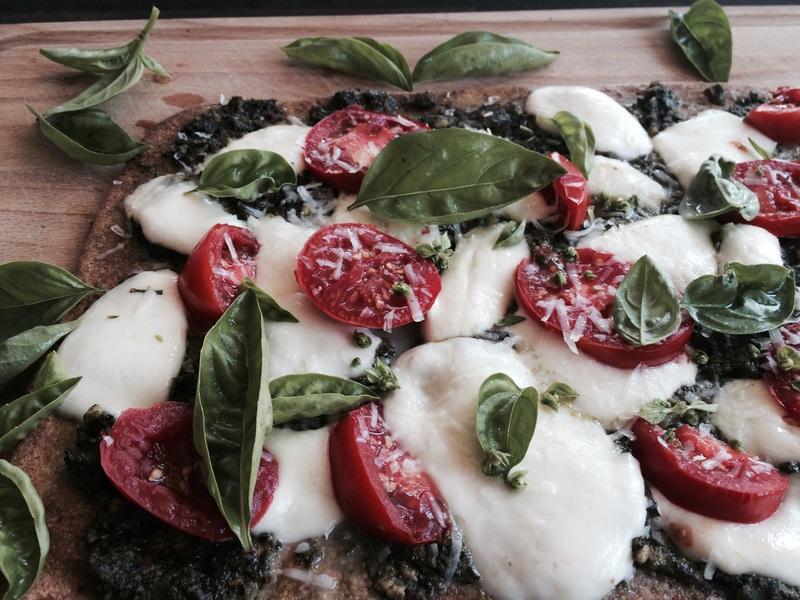 I ran across this link on Pinterest about 6 months ago…Summer No Bake Pizza. The concept was brilliant! The ingredients were simple! Alas, I couldn’t perfect it:( The dough kept sticking to the pan. 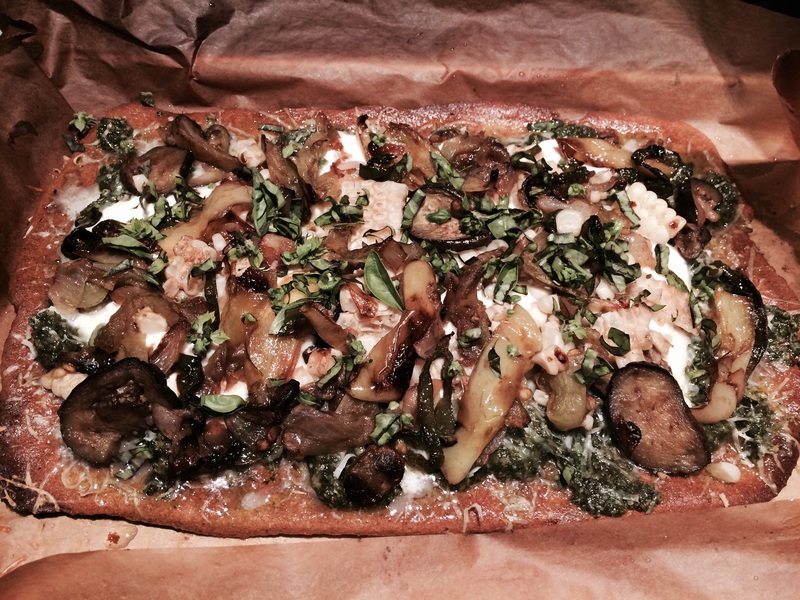 In the end, it made a mess and it wasn’t pretty……but it was super tasty! It was something between a thin crust pizza and a flatbread. So, I decided to forget about the stovetop method and opt to using the same recipe in the oven, in an oiled, parchment lined baking sheet. The results were perfect! And in the end, I was able to enjoy a yummy, GF pizza, made of wholesome ingredients, loaded with protein and void of processed junk! Pure heaven! To start, you must soak 3/4 cup of quinoa overnight, or at least 8 hours. This allows the quinoa to soften up and bulk up! Rinse the quinoa and transfer it to a blender or Vitamix. Add 1/4 cup of water, 1 tsp salt, 1 tsp baking powder and herbs. I opted to add a hefty tablespoon of homemade pesto;) Now blend the mixture on high for 2 full minutes. 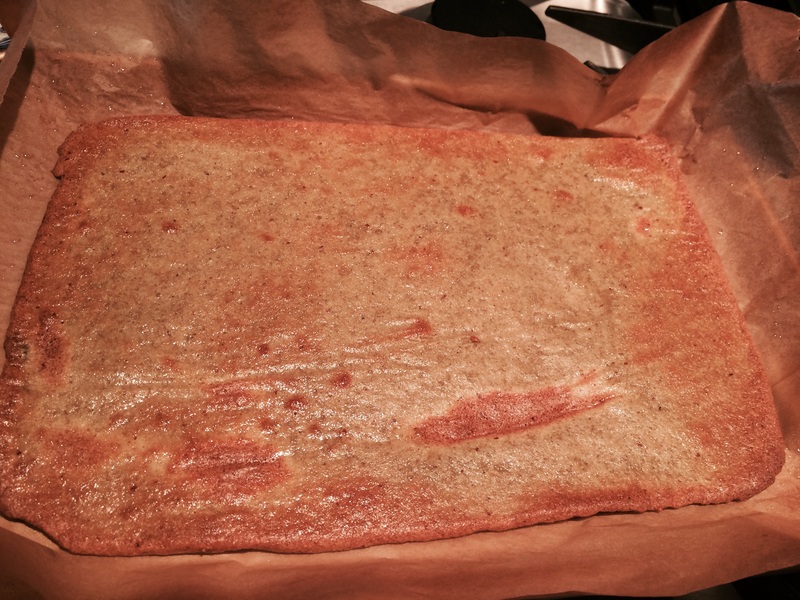 Pour the batter into a small, oiled, parchment lined baking sheet. 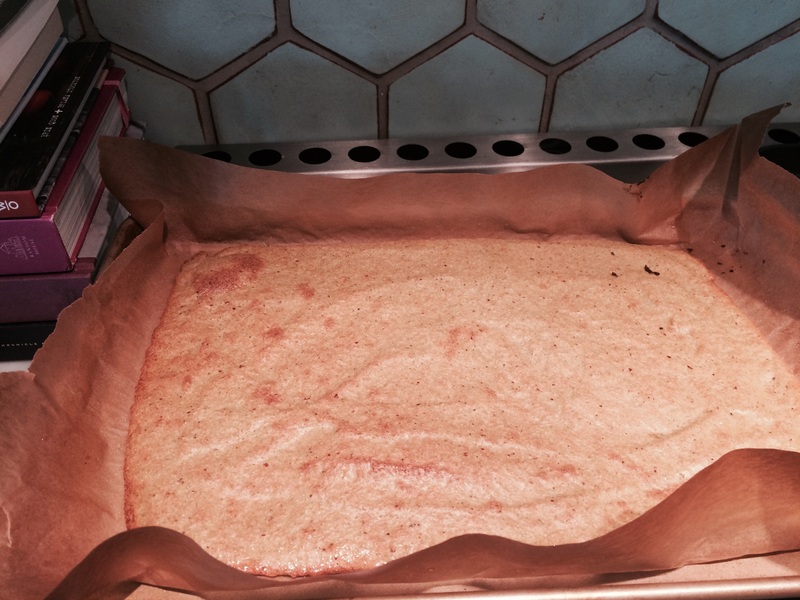 The parchment paper serves two purposes. One is to keep the batter from sticking and the other is to easily transfer the completed pizza for cutting and serving! Make sure to oil your parchment paper! Carefully, pour batter onto your pan! After 15 minutes of baking! Now it’s ready to flip! Bake for an additional 5-10 minutes. Remove from the oven. The crust should be perfectly browned! Perfectly browned and ready for toppings! 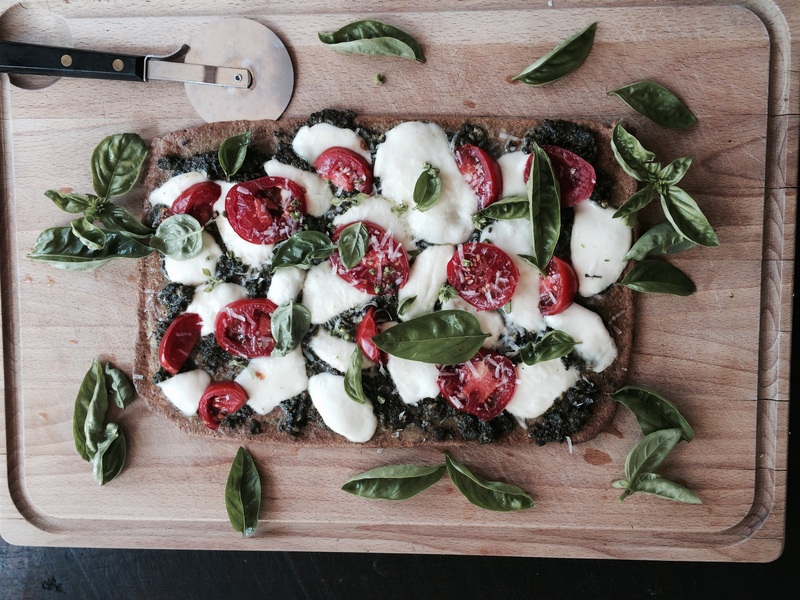 Transfer onto a large cutting board to slice and serve:) I’ve experimented with all kinds of different toppings! This pizza was made with pesto, fresh mozzarella and balsamic roasted veggies (green tomatoes, peppers, onion, eggplant and corn)! A fun variety of balsamic roasted veggies! A simple, elegant meal when served with a green salad and a glass of wine:) I’m thinking of making a large batch of crusts next time and freezing them! I’d love to hear about your creations! Let me know! Bake for 5 minutes, or until cheese is bubbling!